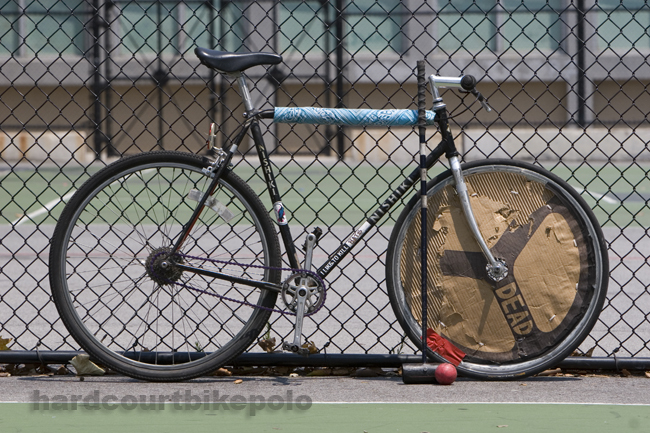 My old polo bike. I broke it, more than once. Strange how much they are like horses, we ride them hard and before too long we have to put them down. I miss this one the most. It’s ashes have been spread in a special place. This entry was posted by Doug D on April 16, 2008 at 12:01 am, and is filled under Bikes of Polo, Just One, Photos. Follow any responses to this post through RSS 2.0. You can leave a response or trackback from your own site. nishikis unite! you’ll have to get a pic of mine, too. Somehow I miss seeing that bike around. The new one’s sweet but it doesn’t have quite the same charisma. Where do bikes go when they die? your bike is looking like a really trusty steed. i´m impressed. hope my one will carry me quite a long time too. So I should save all these mallet prototypes for the eventual bike polo hall of fame and history museum? Hu ya Ben… I saw the remnants of the parts that were once your 1st polo frame while at a certain builder’s shop last weekend and I don’t mean to rain your parade but it doesn’t look like there’s much hope for that one. Sorry to say.